I will be doing a much longer post about the costume I made for my daughter this year, but I finished the hood today and just cannot stand the cuteness. 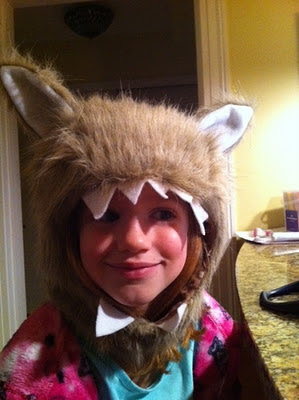 She doesn't like the teeth, so I promised her I wouldn't post this on Facebook (mwahahah!) until I take the teeth off for her. But this isn't Facebook, is it? The costume has a full body with a tail, and I am thrilled with how it came out. Oh can't wait to see the finished look---she must be super excited!